Not that long ago, we wrote about Pre-K for PA efforts happening the Erie-area and the significant high-quality, early education plays. Today, we see a big step in the right direction as the Employees Community Service Fund of General Electric, representing the union workforce, announced its commitment to supporting access to quality early childhood education for all three and four-year-olds in Pennsylvania to the tune of a $30,000 grant to be used to help raise awareness for the importance of quality Pre-K and increase support for expanded access. Additionally, the member run organization pledged to collect 3,000 signatures to be sent to lawmakers in Harrisburg. "The goals of this campaign align with our needs of the communities we support and the members who support the fund," said Rob Celeski, Employee Community Service Fund Chairman, in a press release. "Advancing access to early childhood education to all families—especially middle class working families—helps to level the playing field and create a more qualified workforce. The forward progress of generations will be supported by the advancement of access to quality learning to all families." 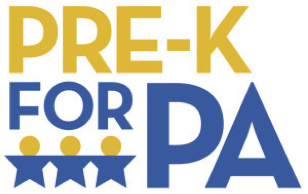 "More and more studies show that early childhood learning benefits our families and strengthens our communities," said UE 506 President Scott Duke, whose members committed to collecting 3,000 signatures to support the Pre-K for PA efforts, in the same release. "Every parent who wants their child to experience the benefits of early childhood learning, should have access to quality programs as part of the public education continuum." "At a time when good-paying, family supporting jobs are becoming harder to find access to early childhood education is becoming increasingly valuable to the next generation," added Pre-K for PA Co-Chair Ronald A. DiNicola. "The employees at GE understand the value of early childhood education and we salute them for recognizing that the time for access for all kids has come." "As a business owner employing more than 2,000, I understand the value of a well educated workforce with access to early child hood education helping build a solid foundation for each and every kid," said Pre-K for PA Co-Chair Nick Scott, Jr. "I could not be more proud to stand alongside the team at GE as they pledge their support to Pre-K for all kids and thank them for their continued commitment to enhancing the communities they live in." In case you missed it, former Pennsylvania governors, Democrat Ed Rendell and Republican Mark Schweiker, were in Erie. Together, they highlighted the need for expanded access to high-quality pre-k as a necessary step toward growing Pennsylvania's economy and building the skilled work force required to attract businesses and create jobs new jobs. Keystone Research Corporation, Joyce Miller, PhD. Pre-K for PA is an issue campaign supported by individuals and organizations across Pennsylvania who believe that investing in our children is the right choice and an urgent necessity. Our vision is that every 3- and 4-year-old in Pennsylvania will have access to high-quality pre-k. We will not endorse nor oppose candidates, but rather we will advocate on behalf of this vision for Pennsylvania's children, schools and communities. For more information www.prekforpa.org. Erie Reader staff can be contacted at contact@ErieReader.com.